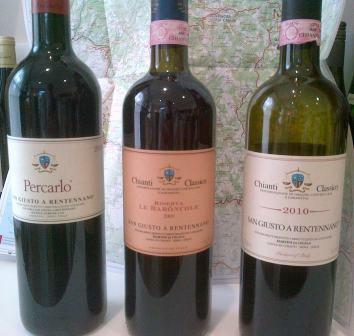 The line-up with Chianti-shire map in background. Properly Sangiovese, with a grainy grippy structure that is not massive but is present as it should be, good fruit that will come out more in time, red and black combined, a good wine that will be even better in 1-3 years, properly made but not over made. 17. This Riserva was first made in 2000 although they made a Riserva as far back as 1975. This sees 18 months in barriques and requires a little more time in bottle from now. The barriques slightly dominate at the moment but this wine is in need of 24 months to mellow and from there more of the Sangiovese character will develop and show, the texture and amount of fruit is great, will be interesting to watch. 16.5-17.5. Rich succulent and fully fruited, very impressive, this is at present a more international stye of wine. Everything is present and in balance, the 20 months in barrique shows but not excessively so, this could be a real gem in a little time. Making generalisations about Tuscany is almost impossible but I have been impressed by all things 2008. There seems a great balance between fruit and a serious savoury side. 18-18.5. Looking forward to flogging and drinking these! !